It is probably because a full one-half of the northern New England year is devoid of most color that I crave the flamboyance of summer. From the time the last leaf blows away in mid-October until the first brave blooms poke through the cold ground in April, the landscape’s palette is constrained to dull browns, gold grays, and stark white. I love winter and snow. But by the time I turn the calendar to April’s page, when I’ve had my fill of skiing and every roar of the furnace coming to life causes me to groan inwardly, it seems impossible that the world beyond the windows will ever move from cold, bleak hues to the fullness and heat of summer colors. I am not the only one who misses the color and rejoices at its return. Before the snow has entirely disappeared from every shady crevice in the yard, many of us are potting hardy pansies to place by the door, selecting the season’s seeds, and plotting the colors we will bring to our porches and gardens, just as soon as the sun is warm enough and the days long enough. Several years ago, on my way to work each day, I passed a somewhat shabby house. The clapboards could have used a fresh coat of paint, and even the surrounding neighborhood seemed tired. Come summer, though, the little house came alive, its porch bursting with countless hues as flowers spilled from hanging baskets and planters on the steps, any blemishes camouflaged now by the myriad of blossoms. So many houses, from the grandest to the humblest, are transformed by flowers in the warmest months. So many of us spend a good bit of cash and countless hours planting and weeding and looking after the plants. We tend perennial beds and marvel as the dull, tired, stick-like stalks cut down last autumn swell into voluptuous vegetation and bright blooms. We fill window boxes and porch planters and hanging baskets with color and foliage and fullness. We cut back the smiling pansies when they get too leggy and deadhead the petunias, hoping to coax them into blooming well past midsummer and toward fall. Downtown planters cascade from light posts, overflowing with buoyant blossoms. Bridge railings are draped in flower boxes, with spikes of color reaching upward and sprays of ivy flowing down. Businesses brighten windows with lively geraniums and cheerful impatiens and trailing vines imbued with color. At my home, the crocuses come first, then the daffodils, their bright pastels in the still-chilly air heralding the return of color. Antique lilac bushes bloom purple and sweet-smelling along the driveway in late May, preceding the pink-tinged white of apple blossoms humming with bees. The lupines arrive in June to fill the fields with purple and indigo and the occasional pink. Through the rest of the summer, wildflowers pop up among the fields’ tall grasses, some familiar, others surprising us with their blooms. Big, orange lilies grow tall outside the kitchen window, where small jars of flowers – wild and cultivated – stand through the summer above the kitchen sink. Our front porch holds a small pot of pansies and a large planter of mixed blooms. Last year I added window boxes to the upstairs railing, filling them with vining petunias and bright snapdragons, adding a bit of color higher than any ground-dwelling plant can reach. The perennial garden out front opens with purple, as the flag irises unfold in the early days of summer. The garden marches on to orange-yellow day lilies, wispy pink astilbes, and subtle green lady’s mantle. Later there will be gold-and-brown rudbeckia, pink sedum, and the tall, yellow, late-blooming stalks my mother calls outhouse flowers (because they grow high enough to obscure a privy). 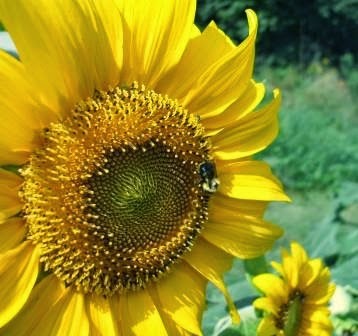 In the heat of summer, I try to appreciate each bloom, every peony pop and burst of bee balm, the brightness of begonias and zestiness of zinnias, lacy-full globes of hydrangea and nodding sunflowers heavy with sunshine. I store some of that happy glow of color in the summer-loving corner of my soul, saving a bit of the brightness for those cold days to come, so that I can remember in the absence of color that winter’s severity will – eventually – blossom into summer’s welcome flamboyance. Original content by Meghan McCarthy McPhaul,posted to her Blog: Writings From a Full Life. This essay also appears as Meghan's Close to Home column in the July 25, 2014 edition of the Littleton Record. We’re a month into summer vacation, and my kids’ carefree meter seems to inch higher every day. After so many months of rising early and trudging downstairs to the breakfast table with sleepy faces and tousled hair, spending days in the routine of school and homework and practice, rushing through the final weeks of the year with recitals and games and spelling tests, they arrived at the freedom of summer. Remember that feeling? The anticipation of an endless stretch of days filled with sleeping in, reading whatever you wanted to (or nothing at all), pedaling your bike around town with friends, long hot days at the beach or the river. Ah, summer. The transition from school year to summer was easy peasy for the kids. It’s been a bit harder for me to adjust, but I’m getting there. On the first day of summer vacation, my children’s alarm clocks were turned off, while mine was still set for early morning. As they wondered what to do with their first day of nothing to do, I tried to figure out how to make a meeting inconveniently scheduled for that first day of no school. I’m a planner by nature and tend to get myself worked up about the growing to-do list, but gradually I’ve eased into a summer routine that allows work and play to exist together somewhat cohesively. In an effort to keep the moans of “Mom, I’m booooored!” at bay (although I think maybe that comes when they’re a little bit older), and to maintain at least some of my sanity – and a few hours of work time each week – I have tried to find that happy mix of scheduling things to do and scheduling nothing at all. It seems my kids (and I) are happiest with a little bit of both. So, they have summer lessons in tennis and swimming and golf, but we also leave plenty of time for impromptu soccer games in the backyard, bike rides through the neighborhood, and running through the sprinkler. We make plans some days to meet friends for a hike or an afternoon at the beach, but leave other days open for whatever happens – hanging at the pool, splashing in the river, or holing up at home with art supplies and a stack of books. 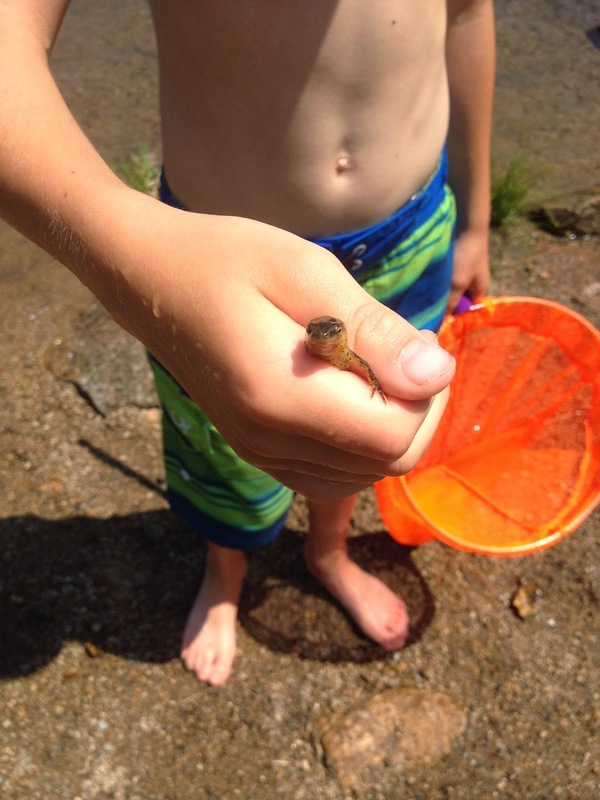 My children have had plenty of time in the first weeks of summer to invent games together, examine flowers and caterpillars and butterflies discovered in our wanderings, catch salamanders and crayfish. They’ve also had ample opportunity to get on each other’s nerves, which is a quintessential part of childhood summers for anyone with siblings. During the inevitable bouts of bickering, I remind my kids that our yard is large and send them outside to stay away from each other until they’re ready to be nice again. With so much daylight and so much freedom, the children seem to lose track of time. And, really, isn’t that one of the great joys of summertime? To forget what day it is and not care what time it is? To eat when you’re hungry instead of when the lunch bell rings? To wonder at the end of the day how it got so late and what you did all day? With no rush to get out the door to school, breakfast has become drawn out and leisurely. Occasionally, ice cream is eaten in place of lunch. The grill is often the cooker of choice for dinner, with the kitchen too hot for the oven and cooking outside just plain simpler. We add fresh greens from the garden to our plates and snack on peas straight from the pod, waiting for the coming-soon bounty of carrots and beans, zukes and cukes and sun-warmed tomatoes. Bedtime, usually strictly kept, has pretty much gone out the window during these evenings where daylight lingers into slow twilight over the mountains. We’ve basked in the smoky ambiance around the fire pit with friends and cousins and grandparents, as the children beg for just one more s'more. We’ve stayed up to watch Fourth of July fireworks. We’ve snuggled together while thunder crashed and rumbled overhead and lightening shot from the dark sky in nature’s own fireworks display. In the late darkness of hazy summer nights, we have crept onto the porch to watch fireflies blink through the field like so many mystical faeries. I often start our summer days asking the kids, “What do you want to do today,” and sometimes we just figure it out as we go along, letting summer’s warm wind blow us where it will, changing course as we need to or want to. Summer freedom doesn’t last forever, after all; we’re embracing it while we can. Original content by Meghan McCarthyMcPhaul, posted to her Blog: Writings From a Full Life. This essay also appears as Meghan's Close to Home column in the July 11, 2014 edition of the Littleton Record.